China dominates the market for Mandarins, Clementines, Tangerines, and Satsumas, with Spain and Turkey behind it. 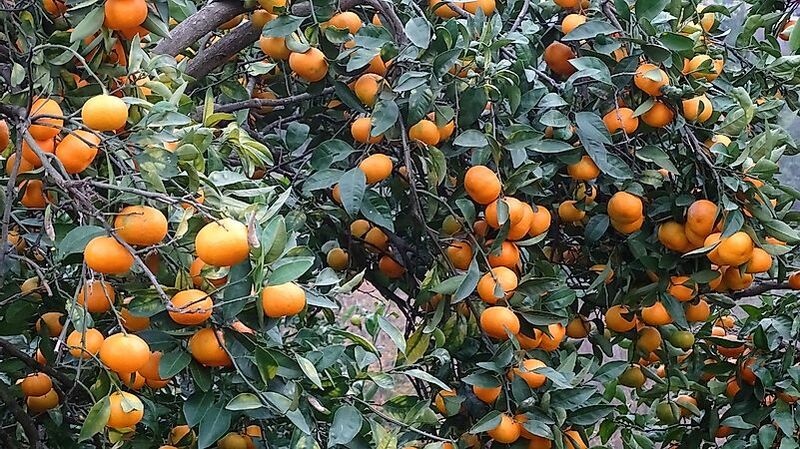 A farm growing tangerine, another popular small fruit similar to mandarins. East Asian and Mediterranean regions lead the globe in production tonnage of mandarins, tangerines, clementines, and satsumas. Satsumas and tangerines are known for their sweetness and hardiness against cold weather among citrus fruits, and originated in East Asia. Clementines are hybrid fruits, whose origins are disputed between those claiming origins in Cantonese China and those claiming that they originated in North Africa. Although marketed as the same, mandarins and tangerines are in fact different botanically. All of these fruits are differentiated from common oranges because of their generally smaller sizes, sweetness of taste, ease of peeling, and lack of seeds. Despite being among the world leaders in common oranges, the United States lags well behind global leaders in the production of mandarins, tangerine, clementines, and satsumas. The US per capita consumption of mandarins has increased by almost 16% in just a decade from a mean value of 0.93 kg in the year 1996 to 1.07 kg in 2005. Over this period, the US production of mandarins had decreased by 3% whereas imports have increased by 376% overall. The US market supply of mandarins in 2005 was around 355,000 metric tons, a 24% increase since 1996. Increased availability and the level of consumption of most popular mandarin varieties, and the reemergence of once popular types such as Satsuma, has led to the reestablishment of the mandarin market throughout the US, especially in California, Texas and Alabama. Currently, the entire stock of satsumas distributed in grocery stores in the US is produced in California. However, Satsuma production in the Gulf Coast has begun to expand after a fifty-year hiatus because the region is known to offer ideal climatic conditions for the production of Satsumas which has led to the saturation of the local markets. China is known to be the global leader for mandarin production with their East Asian neighbors and European Union countries, especially along the Mediterranean coasts. Satsuma mandarins are cold-resistant and their consumption has varied during the century, peaking in 1979 at a rate of 4.9 pounds per person and a drop of 2.3 pounds per person in 1990. Changes of occurrence and frequency of the seasonal availability of mandarins in different countries vary considerably. In China, mandarins are available from the month of January through the month of December. In Mexico, they are available in January, February, March, April, October, November and December. The European Union is able to avail mandarins during the months of November and December alone. In the US states of Arizona and California, the seasonal availability of mandarins is throughout the year, which is different from the state of Florida, where producers miss out during the months of June, July and August. Future trends of mandarin market share supply should not be worrying since more market share simulations of clementine, tangerine and satsuma are to be carried to achieve exact seasons so that mandarins’ availabilities in the global market are not threatened from season to season. In the larger scope of mandarin production and marketing, the industry must mandate quality standards in determining the timing of the harvest season for various varieties of mandarins. Simulations can as well be used to estimate the market shares for tangerines, clementines and satsumas as the harvest season progresses. Market share proportions should also be considered before the production of mandarins. The market share proportions of the mandarin are in the ratio of 4:3:2 for tangerines, Satsuma, and Clementine respectively. These proportions may differ in the future but this would have to be determined by more simulations of the market share. Also, during the Christmas season, there is a negative effect on the satsuma market share and a positive effect on tangerines. This is the very same period that clementines and tangerines come onto the market as well. Where Is Broccoli And Cauliflower Grown? Where Are Carrots And Turnips Grown?